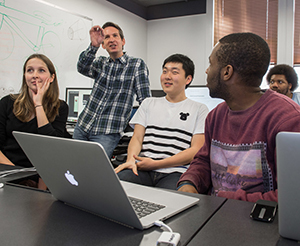 The College of Arts and Letters will launch an interdisciplinary minor in Computing and Digital Technologies (CDT) starting in the fall of 2015. The CDT minor will offer a foundation for Arts and Letters students interested in all facets of technology—from technology consulting and cyber security to the digital arts and humanities. “One of the most exciting aspects of this program is that it was designed from the beginning with input from Arts and Letters alumni who are now leaders in the technology industry,” said Charles Crowell, associate professor of psychology and director of the program. The CDT minor will include a two-semester core sequence of programming courses offered through the College of Engineering, as well as three elective courses from an array of options in the College of Arts and Letters and the College of Engineering. “My department is pleased to begin this collaboration with the College of Arts and Letters, as computing and digital technologies increasingly pervade all of the scholarly disciplines,” said Patrick Flynn, the Duda Family Professor of Engineering, who will teach the core sequence. Reflecting the diversity of the College of Arts and Letters and the myriad career choices within the field of technology, students in the CDT program will be able to specialize in one of six tracks—User Interface and Experience, Cyber Safety and Security, Cognitive Science, Digital Humanities, Digital Arts, and Technology Development and Management. No matter which path students choose to pursue, the CDT minor is an exciting option, said Rob Cain ’91, principal, IT Strategy and Enterprise Architecture Practice for PwC, who served on the advisory committee for the program. “It is no longer possible to separate technology from any commercial or academic pursuit,” said Cain, who majored in English at Notre Dame. “In many cases, they are integrated and inseparable. However, it is very easy to separate those people who can humanize technology and speak to it with fluency from those who cannot. The top employer of Notre Dame Arts and Letters graduates is Epic, a software development company in the healthcare industry. 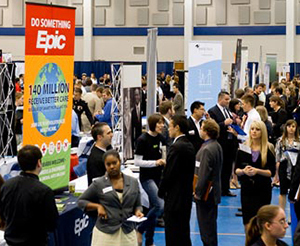 “We are specifically interested in hiring liberal arts graduates,” said Mara Oyster ’04, a recruiting manager at Epic. “Given the skills that students develop in a liberal arts program, we have always been willing to train our new employees in the technical skills they will need. “But the CDT program will open up additional doors for Arts and Letters graduates, even here at Epic, and give students a better understanding of their career options,” she said. Kevin Laracey ’86, who majored in American studies and computer applications, also served on the CDT advisory committee and said he knows firsthand how valuable this combination of skills can be. “My Arts and Letters education has been an essential component of my success as an entrepreneur, technologist, and executive in public and private companies for more than 20 years,” said Laracey, co-founder of Paydiant, Inc.
From the executive director of the Mozilla Foundation, who majored in history, to the cofounder of Paypal, a philosophy major, tech industry leaders across the country are stressing the importance of a liberal arts education. For more information on CDT, please contact Program Director Charles Crowell or visit the CDT website. Originally published by Carrie Gates at al.nd.edu on December 10, 2014.